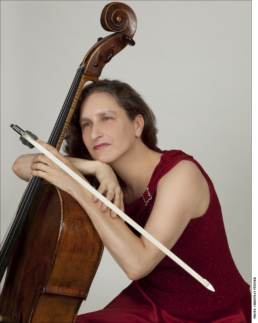 Hailed by Fanfare Magazine as “one of the great cellists of our time” and “in the elite of today’s concert cellists”, Nancy Green is an internationally recognized recording artist, known for her highly acclaimed CDs of previously unrecorded works as well as staples of the cello repertoire. Her numerous CDs, which include many premieres, are broadcast frequently both in the United States and abroad and her performances have earned rave reviews internationally. Her recordings on the JRI (USA), Cello Classics (UK), and Biddulph (UK) labels have received special notice in publications such as Fanfare Magazine (Want List), Strings Magazine (Editor’s Choice), MusicWeb International (CD of the Month), and Classical Music Magazine (CD of the fortnight). The Green/Moyer duo was called by American Record Guide “some of the best chamber playing around” and international press reviews have likened her to great cellists such as Mstislav Rostropovich, Yo-Yo Ma, Leonard Rose, and Jacqueline du Pre.